It's now official: The Jesus Project launched by R. Joseph Hoffmann under the auspices of the Committee for the Scientific Examination of Religion (CSER) will hold its first academic conference this December in Amherst, NY. Though I'm not an official member of the Project, I've been in communication with Hoffmann about it since the beginning, and I will be one of the speakers this December, along with Hoffmann, Gerd Lüdemann, Robert Eisenman, Dennis MacDonald, James Tabor, Hector Avalos, David Trobisch, Robert Price, and many others. The official Jesus Project website is still under construction, but for those who may have "heard things" there is an old but useful update by Hoffmann on the hiccups in launching the Project. But it's in full steam now. The aim of the project is to seriously evaluate the evidence for the historical Jesus, without prejudging the conclusion for or against historicity, and this year's inaugural meeting is titled "Sources of the Jesus Tradition: An Inquiry." My talk, "Bayes Theorem for Beginners: Formal Logic and Its Relevance to Historical Method," will conclude the Saturday "Evidence and Methods" section (the last of three speakers between 9am-11:30am) on December 6 (I meant to say "Relevance to Historicity Criteria," since that's what I'll discuss, but the submitted title is accurate enough). Roundtables and talks run from the eve of Friday the 5th to noon on Sunday the 7th and include many very intriguing subjects, mainly about methodology and how to use our sources. That's much of what my book is about, so I shall get to preview and discuss with scholars some of my book's material and get a feel for what others are doing on the same topics. This is a formal academic conference, so attendance is by paid registration only, and like other academic conferences, it's expensive--though about half what I've seen to be typical, it's still beyond the means of most ($175, plus another $95 to get all the meals). It will be held at the Center for Inquiry in Amherst, New York. I assume you can get more information (including a registration form) by mailing a query to CFI (CSER) P.O. Box 741, Amherst, NY 14226-0664 or calling the Center (at 1-800-818-7071) or sending a fax (to 1-716-636-1733). Okay. Just a parochial political rant today. And it's not even about the Presidency or anything the Network News drones on about 24-7. I'm sick of bond measures. They're phenomenally stupid and an insult to Americans' intelligence (or an exploitation of their stupidity, take your pick). Oh, right. Some of you might not know what I'm talking about. I don't know how it works in other states. 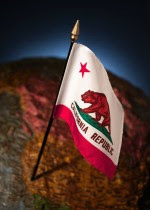 Here in California, invariably every election is choked with bond measures. Bond measures for everything. Boring, stupid bond measures. The date has been finalized for the MSU event. I'll be appearing on the Springfield campus of Missouri State University on Saturday, October 11 (2008). 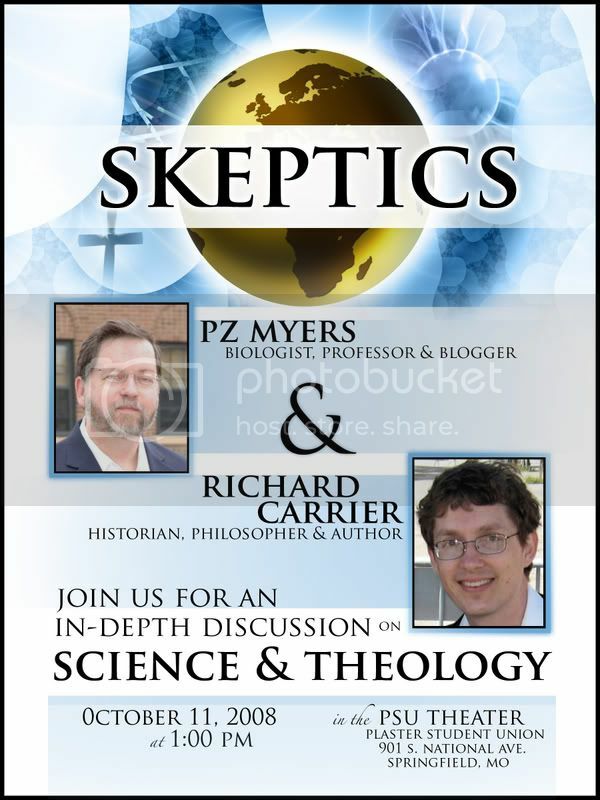 The event is a double-header, myself and PZ Myers (some details here). It's scheduled to run from 1pm to 4pm with informal meetups afterward. Sponsoring the event is the MSU chapter of the Church of the Flying Spaghetti Monster (see flyer, and for more on the CFSM see wiki, and there is also a good news article about the campus group, with associated video). The event will be held in the Plaster Student Union Theater (901 S. National, 2nd floor, southwest corner) on the MSU campus in Springfield, Missouri. Contact man for further info is J.T. Eberhard (417-234-1399). If you use FaceBook, you can help the organizers plan for how many will attend by informing them here. Scientific values have been in conflict with religion for thousands of years. So have the findings of science. Using the ancient Roman debate between science and religion as a starting point and model, Dr. Carrier will show how science has actually won the debate, in both facts and morals, then goes on to prove it shouldn't matter what the Bible says: if there is moral truth it should be evident and demonstrable from the natural facts of the universe and the human mind and body, without any appeal to god or religion. And once we know the truth, we don't need anything else. Though just so you know, I will be distinguishing scientific religion (which is compatible with scientific values and even promotes them) with nonscientific religion, and it's only the latter that I will argue is and always has been in conflict. Although I should warn the pious: there will be some irreverent humor. I will be signing and selling copies of my book Sense and Goodness without God at the event. Update: video of my talk at this event has subsequently become available online (see Hambone Videos). A link is also available there to view the accompanying slideshow. I've sent a formal progress report to all donors explaining what I've gotten done, what's delayed me, and what I still have to do to complete my book On the Historicity of Jesus Christ. If you donated to that project and haven't received that progress report, please email me at once. That's for donor eyes only. But for everyone, here's an expansion on one item in it. 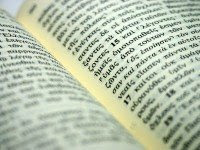 Last entry here I already mentioned one of the issues that came up: my stumbling into several muddles in New Testament studies that I thought had been reasonably resolved by now. Many issues I thought were cut-and-dried are actually mired in complexity, and my research in these areas has absorbed far more time than it should have. The two most annoying examples of this (though not the only ones) are in dating the contents of the New Testament and identifying their authorship and editorial history. There is no consensus on either, even though standard references (like Eerdman's Dictionary of the Bible, The Oxford Dictionary of the Christian Church, and The New Interpreter's Bible) tend to give the impression there is. Even when acknowledging some disagreements, they do not accurately convey the shear number of disagreements and the complexity of determining their relative merits. In other words, not only is there no consensus, but there are dozens of positions, and arguments for each are elaborate and vast. It was only after over a month of wasting countless hours attempting to pursue these matters to some sort of condensable conclusion that I realized this was a fool's errand. I have changed strategy and will attempt some sort of broader, simpler approach to the issues occupying my chapter on this, though exactly what that will be I am still working out. It will involve, however, a return to what historians actually do in other fields, which New Testament scholars seem to have gotten away from in their zeal to make sense of data that's basically screwed in every conceivable way. For when it comes to establishing the basic parameters of core documents, I have never met the kind of chaos I've encountered in this field in any other subfield of ancient history I've studied. Elsewhere, more often than not, either the matter is settled, or no one pretends it is. It would bore me (and you) to attempt a thorough account of all I encountered on this subject of late. So I'll just walk you through one tiny example of the countless annoying paths I ended up on. And that only as briefly as I can (which is not very brief at all), since even this one story would bore the bristles off a boar if recounted in detail. It's probably boring enough as it is. In most standard references or scholarly discussions, it's routinely claimed that the early Christian martyr Ignatius quotes the Gospel of Matthew in his letters, and Ignatius wrote those letters in the year 107 A.D. (or so), therefore Matthew was written before 107 A.D. That would be a fine example of establishing what we call a terminus ante quem, "point [in time] before which," the latest year a particular document could have been written. If either premise were a settled fact, that is. Unfortunately, they aren't. Yet typically this little problem isn't mentioned or explained, and these premises are declared in some form as if no one doubted them.